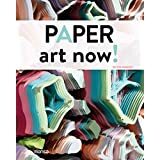 "Paper art now!" shows you many of the opportunities that paper offers art lovers, making three-dimensional shapes through the use of bending and folding techniques and playing with colors and light effects, thereby making innovative use of paper. In the following pages, you will be shown works from artists such as Charles Clary, Bovey Lee, Yulia Brodskaya, Eiko Okala, Matt Shilian, Zim & Zou, Nathalie Boutte, Yusuke Oono, and many others. Their magnificent creations have been used for exhibitions, advertising campaigns, sculptures, decorative elements, logos, posters and other such things. They help us learn about the various ways that paper can be used, where imagination combined with technique can give rise to the most breathtaking works both for their beauty and their meaning.